The famous and often reprinted portrait of the West’s most influential military theorist, Carl von Clausewitz, was painted by Wilhelm Wach in early 1830s. One of Prussia’s most fashionable artists of the era, Wach portrayed the officer as a serious man with melancholic look and penetrating but sad eyes. Wach’s painting, made either in the last years of Clausewitz’s life or even postmortem, casts the military theorist as rather gloomy in demeanor. This image seems to confirm the unfavorable perception that many people hold: an unhappy staff officer disenchanted with the turbulent world around him who scribbled his thoughts in long, complicated, dejected sentences. But would our perception of Clausewitz and his seminal work, On War, change if we could see him as a young, ambitious, and energetic officer? If, instead of a withdrawn and reticent character, he appeared as a sympathetic, adventurous man with a tendency for self-depreciating jokes and sassy comments about his superiors? Would a more likable image of its creator make On War an easier read? A newly found drawing depicting Clausewitz early in his life encourages just such a genial perception. It powerfully enhances the image of Clausewitz as an energetic and driven personality, a young officer full of resolve and self-confidence. The date of its creation reveals fascinating details about the military theorist’s life and enhances our understanding of his legacy. The newly discovered portrait. All rights reserved Bernd Domsgen and Olaf Thiel, Freundeskreis Clausewitz. The reappearance of this picture is due to the restless and thorough research of two men from Clausewitz’s hometown of Burg bei Magdeburg. Bernd Domsgen and Olaf Thiel are part of the local Clausewitz Society (Freundeskreis Clausewitz). For decades, they conducted meticulous research on the life and family of their town’s famous native. 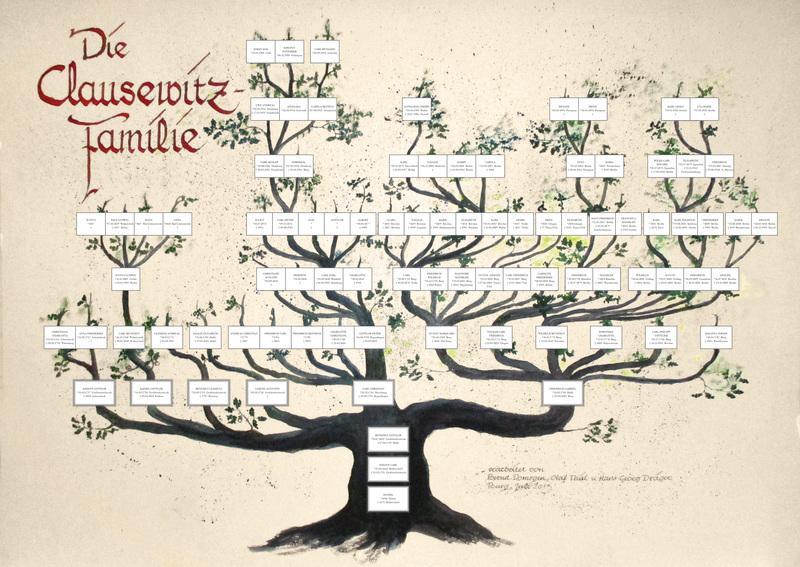 Last year Domsgen and Thiel managed to recreate Clausewitz’s family tree and subsequently contacted most of the descendants of his siblings. (Clausewitz and his wife Marie were childless). The Burg historians asked the families to search their attics and cellars. From one of the descendants’ dusty cabinet, together with a windfall of other family documents and memorabilia, came this drawing. The drawing is very small, just 3×4 inches, with a brief note on the back: “Major General, Military Writer Carl von Clausewitz, Born on 1 June 1780 in Burg, Died on 15 November 1831 in Breslau.” The second date is clearly mistaken — Clausewitz died a day later, on the 16th. To the layman’s eye, it appears that there are few details to date the sketch. However, for Dr. Gerhard Bauer, the expert historian of uniform and battlefield insignia at the Bundeswehr’s Museum of Military History in Dresden, the elements featured on the shoulders and the neckband are enough to make a comprehensive analysis. Dr. Bauer suggests that the drawing depicts Clausewitz between the years 1808 and 1810. While reiterating that the lack of colors makes firm conclusions impossible — in 19th-century armies, different regiments and departments required different colors of facings, collars and cuffs — he surmises that Clausewitz is wearing the uniform of an officer serving at the general staff. Generals and their staff used to put braided epaulets and fourragères on the right shoulder, just like those shown in the drawing. Then, in all likelihood, the jacket was blue with silver buttons and facing, and with crimson collar and cuffs. Inscription on the back of the drawing. This helps us date the drawing. After Clausewitz’s return from France, where he spent 1807 as a prisoner of war, he assumed a dual staff position. Clausewitz continued his previous service as adjutant for Prince August, a cousin of the king and now a member of the Military Reorganization Commission at the War Department. At the same time he also worked informally as personal assistant for his old mentor, Gerhard von Scharnhorst, the head of the commission. In early 1809 Clausewitz left Prince August and officially served solely under Scharnhorst. As Dr. Bauer explained in an email to me, in August 1810, Clausewitz was promoted to major, which required changing the epaulets on the left shoulder to different insignia. Yet because there are no noticeable details on the left and obviously the uniform’s colors are missing, Dr. Bauer suggests that the period between 1808 and mid-1810 is the approximate creation date of the sketch. This means the drawing in Burg shows Clausewitz between the age of 28 and 30, possibly the earliest remaining image of him. The question about the sketch’s creator, however, is more complicated since it is not signed. Despite the lack of academic schooling, Clausewitz’s beloved wife, Marie, was a talented artist in her own right. She painted, for instance, the Prussian war hero August Neidhardt von Gneisenau in 1816. That portrait is now a part of the German Historic Museum’s permanent collection, next to such famous images as Friedrich Bury’s Gerhard von Scharnhorst and François Gérard’s Herman von Boyen. The erroneous date on the back of the drawing, of course, might indicate that Marie was not the artist. Of all people, she would have known best when her beloved Carl died. However, it is very possible, due to the detailed uniform, that the drawing was made in person around 1808–1810 and the note on the back was added later, after Clausewitz’s death, by someone else. The strongest possible argument for Marie as the artist is the liveliness and humanity of the image. Marie lacked extensive academic training, a fact clearly revealed in her portrait of Gneisenau, a work that did not adhere to the artistic conventions of the day. She painted the general not as glorious warrior but as a tired man with puffy eyes, something no professional artist of the era would do. The Burg drawing is marked by the same humanity. In the mysterious drawing, Clausewitz’s eyes are full of love and trust, the face relaxed and open, the lips almost smiling and ready to mutter some self-deprecating joke. If Marie was indeed the artist, this would narrow the possible dating of the sketch even further, since Clausewitz, together with the Prussian government, resided in that period in Königsberg, and only came back to Berlin and Marie in December 1809. This would mean that she painted him sometime between late-1809 and mid-1810. Still, nowhere in the newly discovered and complete correspondence between the Clausewitz couple is the sketch mentioned. This lack of tangible clues make, for the time being, any firm conclusions about whether it was Marie who made the drawing impossible. What Clausewitz’s detractors fail to realize is that Marie also mixed into these dark words her own heartbreak and despair at her beloved husband’s early death when he still had so much to offer to the world. Indeed, just a week later, she introduced a more balanced image. Clausewitz’s obituary, undoubtedly with Marie’s cooperation, presented a long account of his achievements as the soldier’s soldier fighting since boyhood and then participating “in that colossal battle at the gates of Moscow [Borodino],” and as a talented staff officer “at the side of the greatest leaders.” Clausewitz, the obituary noted, had risen from humble origins to a general officer’s rank and from provincial Burg to being a part of Prussia’s military and intellectual elite. Perhaps prompted by the evident humanity of this portrait, we should ask ourselves whether the appeal of “the dissatisfied Clausewitz” is also due to our tendency to seek to simplify complex personalities and phenomena. His image as a dashing soldier clashes with idea that scholars live in ivory towers and just observe and describe events from afar. Certainly, Clausewitz was a driven and courageous officer, as hungry for battles, promotion and career advancement as the next man. But he also dreamed of composing “basic ideas that might bring about a revolution in the theory of war.” When Europe, after two decades of bloodshed, went back to peace in 1815 — and the opportunities for stellar rise in the military shrank — he did just that. On War was not a substitute for a failed career but the attempt of a battle-hardened officer to summarize his experience. And it could not have been written in a simple, perky language, nor its ideas captured in less complex or vehement fashion, because as every soldier knows, war is complicated, nasty, and vicious. Vanya Eftimova Bellinger is an independent scholar and journalist. Her biography, Marie von Clausewitz: The Woman Behind the Making Of On War, just released by Oxford University Press-USA, is based on the newly discovered complete correspondence between Marie and Carl von Clausewitz. Follow her on Twitter at @VanyaEF.